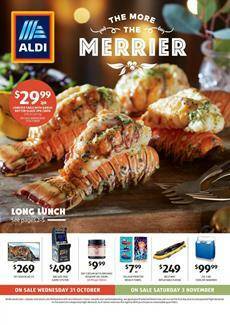 Seafood is an important category in the food part of this Aldi Catalogue Special Buys Week 44. Find nice treats, side dishes, cooked lobster, lobster tails, and shrimp on pg 2 of the catalogue. Scallops, salmon and more seafoods can be seen on pg 2-3. More deals from the food range, are about the turkeys. Turkey Crown, stuffed turkey breast roast, turkey thigh roast, whole duck and more delicious ideas for lunch are available on pg 4-5. If you want to celebrate with the family in Halloween or Thanksgiving, Aldi is a market where you can find awesome prices on proper foods. The electronic range is an extraordinary sale by Aldi Catalogue. They are on pg 6&7. 3D printer, graphics tablet from a popular brand, paper shredder, super heavy duty batteries and more are featured in this catalogue. You can also buy filament for the 3D printer. Get a brand new HD TV by Bauhn. 39" TV is only $269 at Aldi on 31 October. Retro games are a part of the new catalogue. You can see the games like Scrabble in its old style (retro edition), UNO Retro, Arcade One game system and more fun stuff is available. While people are hyped for the new AAA games like Red Dead Redemption 2 or Battlefield 5, some of us like to hang out with the retro, good old games. Moreover, the catalogue contains cosmetics and beauty products such as Lacura photo-fit hair spray, mascara, night cream, and more skin care products for everyone.